The disputed garage of the 73-75 Morse Street property is two stories high and stretches the length of two rear abutting properties and just five feet from the property line. Several residents spoke out against the large residential garage being constructed on Morse Street on the Southside of Watertown at Tuesday’s Town Council meeting, and Town Council President Mark Sideris told them that construction has been halted on the building. The garage going up at 73-75 Morse Street was allowed to be built by the Town’s Planning Department to replace a condemned garage. The new building has a second story with what appears to be living quarters, and it sits just five feet from the property line of the neighbors backing up against the property. Judy Antonucci lives right behind the property and said she and her neighbors were never notified about the proposed garage, nor were they giving a chance to oppose it. She added the garage has made a huge negative impact on her property. Ellen Ridge, a nearby resident, said the garage is 18 feet tall, and neighbors have seen plumbing going into the area above the garage. “It is no longer just a garage,” Ridge said. Watertown resident Chuck Dickinson said that the issue is larger than just the one property. “This really is an issue of the credibility of government at the local level,” Dickinson said. After the residents spoke during the Public Forum, Sideris told them that the developer had been into the Watertown Planning Department earlier that day. “Work has stopped and the garage will be redesigned,” Sideris said. He added that he is considering bringing a proposal to the next Town Council meeting to look into whether the Town should change the rules regarding garages. Any change to Watertown’s Zoning Ordinance would have to go to the Planning Board first and then be approved by the Town Council. After the meeting Steve Magoon, Assistant Town Manager and Director of Community Development and Planning, said that residents had also contacted the Planning Department about appealing the decision of the Watertown Zoning Enforcement officer to allow the garage to be built without getting a special permit from the Zoning Board of Appeals. This would be required if it was not an existing non-conforming condition. He said the garage had been allowed because the previous garage was grandfathered in as a non-conforming structure in a two-family zone (T Zone). The property also has a one family house and a two family home on it. The garage and the two-family home had been condemned, Magoon said, They were allowed to be rebuilt by right (and not having to go before the Zoning Board), he said, because condemned structures are treated the same as if they were destroyed by a fire or natural disaster. When the developer came in this week, Magoon said, Planning Department officials discussed the garage that has been built. 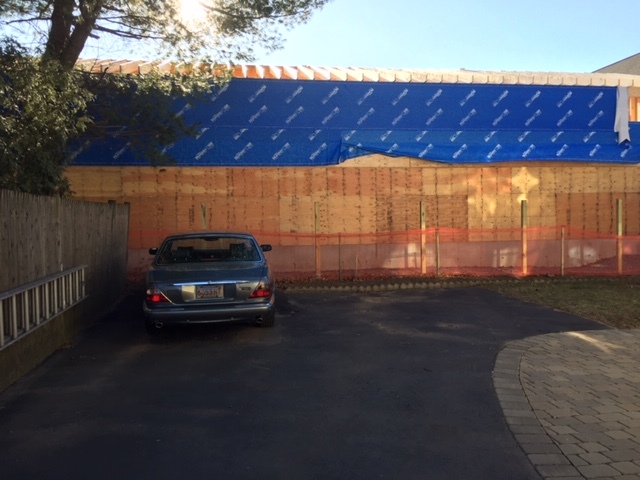 “We said we have real concerns that this is a two-story garage,” Magoon said. Whether the developers have to appear before the Zoning Board will depend, Magoon said, if the neighbors are satisfied with the new design for the garage. Wish the TC had made the decision to regulate garage construction before they built that monstrosity at Athena. Good luck to the south side neighborhood trying to stop this garage construction. Our zoning regulations are a joke. It’s a disgrace what is allowed to be constructed in our town. It appears that “Zoning & Planning” is a mere suggestion in this town. Mr. Dickinson is absolutely correct. The credibility of Town Government is at stake here. There have been so many bad developments that have marred Watertown. There are many illegal apartments and tons of work being done without permits. The town has allowed poorly maintained telephone poles to be blown over rather than put the screws to the owners of the poles. The list goes on and on. Does Watertown have an effective town government or not? I agree, there is a problem in the process that allowed this construction to progress without proper oversight. I feel badly for what the neighbors are going through. This could happen to any one of us in any of our neighborhoods. Our property values and quality of life are at stake here. The town government is responsible for the irresponsible development that continues to occur without thought for the abutters. I cringe as I watch single family homes being demolished one after another and replaced with monstrous duplex condominiums with inadequate off street parking for the increased dwellings. Enough is enough!! It is hard to believe that our regulations and our Town staff allowed this to proceed, without notice to abutters, and without questioning the absurdity of the design and its impact on neighbors. Only in reaction to the legitimate anger of the neighborhood has this been brought to light. How many other things have slipped through because neighbors were unable to mobilize? We need to be able to count on our Town Departments and on our regulations to do the job that the neighbors did here. Wake up Watertown, it’s time to replace the city government with one that works for the people and not one that works for their own profit! The reason for all this development is to increase the tax revenue. Why? For more money for fire, police, and the schools? Hardly. To make sure the funding of retirement accounts of the elected officials continues so when they retire to Florida they’ll keep getting their checks while everyone left behind are packed in like sardines. This will continue because these zoning regulations are really zoning suggestions. It would be helpful if the building department could explain in more detail why this occurred. I spoke to the zoning officer and I received a respectful reply to my questions. This seems like a good opportunity for the city to gain some credibility by commenting to the public. They may have respectful answers, but the fact that this could be done is indicative of a problem somewhere in our Town government. But I think, in response to the wide spread outrage over this case, that it is incumbent on the Town to explain to the public. It seems to me that the system worked. Except for the most basic fact of no neighbor notification of changes to an existing structure. Now that should not have been overlooked. Especially by the contractor! If proper notification had been given then this would have been resolved in an orderly way. A clarification is also warranted on weather a permit to rebuild an existing garage, conforming or not, can then be expanded to include a living unit? I suspect and hope that any plumbing in a garage was for a wash room at most.